World War II holocaust survivor, Bronia Roslawowski, was born Brucha Kibel, in Turek, Poland, to Tzvi Eliezer (Hersh) Kibel and Bluma Bayrach. She was born in about 1926 but we were never really sure about her age! 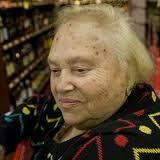 She died July 14, 2010, in her adopted hometown, Kansas City, Missouri, after a long and meaningful life. She was beloved by all who knew her–and she seemed to know almost everyone. On September 4, 1939, German armed forces marched into Turek, where Bronia lived with her family. After two already difficult years, in December 1941, Bronia was sent to Inowroclaw Straflager in Northern Poland. A “resettlement camp” during the war, it was the first of approximately 5 concentration camps in which Bronia survived the war. 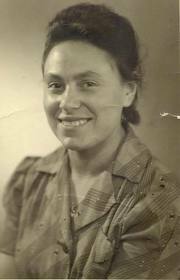 In 1943 she was deported to Auschwitz-Birkenau. She worked in a forced labor camp at Telefunken plant in Reichenbach, escaped the gas chamber in 1944 and was forced on a death march shortly before war’s end. Her right arm was tattooed with the number 57365. Still, despite all that she suffered, she survived. She was liberated by U.S. servicemen in 1945 and worked briefly in a resettlement camp before moving to the United States. Only she and a brother survived the war. Bronia married Mendel Roslawowski, himself a survivor of the camps. Together they raised his son and her three daughters. They opened the M & M Bakery at 31st & Woodland. A popular neighborhood deli, it was a favorite of the local community, medical students and young lawyers. Her brisket and bagel sandwiches were absolutely priceless. 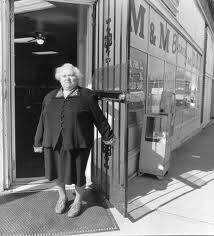 She had photographs on her walls of children who frequented the deli, many of whom she fed free sandwiches and cookies. She hugged her customers and seemed to find time to make each of her regulars feel loved. To Bronia, no one was ever a stranger. Bronia never forgot her war-time experiences. She was determined not to let those experiences, or the loss of her family, control her life. She laughed easily and often. She opened her home to her extended family and her children’s friends–who came to feel like family. At the same time, anxious to educate her community about the horrors of war, she spoke regularly on behalf of survivors about the holocaust, and worked with the Midwest Center for Holocaust Education. Her message was a message of love., stating She forgave those who harmed her, insisting they are all God’s children. She acknowledges the hate and ugliness she saw in the world and she denounced Nazis, but not the German people. She stated that “you cannot condemn a nation.” “I don’t hate” she repeated. Prior to her death she was one of 52 Kansas City Holocaust survivors and war refugees whose stories are included in the book From the Heart. 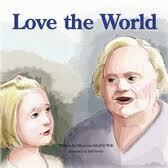 She is also the subject of a children’s book, Love the World, by Maureen Moffitt Wilt focused, obviously on her message of love. It is beautifully illustrated by Jeff Porter. The photograph of her family, taken at her granddaughter’s marriage, is an image of a woman who not only survived the war, but thrived. She lived a rich and full life. Bronia’s life, and her message of love, are reflected in the strength and commitment to family and community of her children, grandchildren and great grandchildren. For Bronia, her family and all of the other Bronias, the horrors of their early lives gave way, to meaningful lives here in the United States, in Europe and throughout the world. A victim of hate, she became a messenger for love. She understand that as she suffered due to the hate and intolerance of others, she also was given a new life by liberation forces. Neither their sacrifices, nor Bronia’s message of love, should be forgotten. This entry was posted in Family, History, Reviews, Tips and Words of Wisdom, Social and Economic Issues and tagged Bronia Kibel, Bronia Roslawowski, Hitler, holocaust, Jewish, liberators, Poland, survisors, Turek, U.S. Soldiers, war, World War II. Bookmark the permalink.